Despite recent uncertainty in financial markets, the economic outlook for the banking industry remains positive. Regulatory forces are encouraging innovation and new digital technologies are providing opportunities to improve customer experiences. There are strong indications that banking organizations worldwide understand the primary trends impacting the industry as well as the actions that are needed to respond to competitive pressures. The question is whether banks and credit unions will prioritize the deployment of human and financial resources to respond to these changes. Will legacy financial institutions embrace change, take appropriate risks and disrupt themselves to meet the needs of consumers, small businesses and corporate customers? For the eighth consecutive year, we surveyed a panel of global financial services leaders for their thoughts on retail banking and credit union trends and predictions. The crowdsource panel included bankers, credit union executives, industry analysts, advisors, authors and fintech followers from Asia, Africa, North America, South and Central America, Europe, the Middle East and Australia. We used the insights from our panel as the foundation to develop a global survey of executives involved in the financial services industry, providing a prioritization of our trends. Our global survey also provided an opportunity to do an end-of-year review of last year’s projections. Finally, the survey collected insight into strategic priorities for 2019 and analyzed the progress being made by financial institutions in the process of digital transformation. As we look to 2019, there were some noticeable changes in the trends from previous years. For the first time ever, the use of data, AI, and advanced analytics was ranked first, replacing improving the customer experience as the number one trend. In addition, there was a realization of the importance of open banking and APIs by organizations globally. Finally, the importance of innovation was also a trend that increased in importance in this year’s survey. 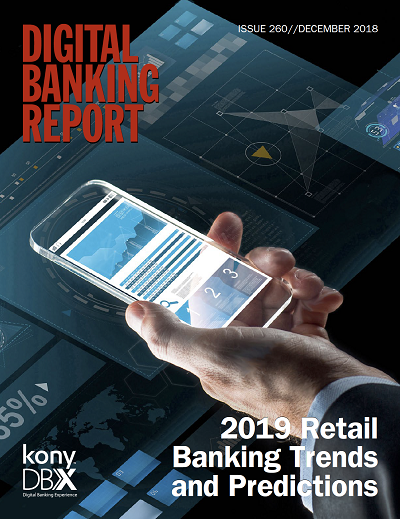 By collecting insights from leading influencers, ranking the trends using an industry survey, and including extensive analysis around the progress of digital transformation, we have developed the most comprehensive annual trend report in the banking industry. For the fourth consecutive year, the research, analysis and Digital Banking Report were sponsored . We hope this year’s projections are helpful with your planning and implementation processes. Insights on future trends in banking from industry leaders as well as research results from hundreds of financial organizations worldwide. В интеренете нашел авторитетный веб портал на тематику http://klimat-group.com.ua. ©2018 Digital Banking Report. All rights reserved. Currently, we are unavailable to chat. Please enter your message here and we’ll respond within one business day.